A huge thank you to my niece for recommending this one to me! After nearly abandoning it at about 20%, I stuck with it and am glad I did. The Cellar ended up being much better than I first thought it would be. A great choice for reluctant high school readers. SUMMARY: Sixteen-year old Summer Robinson doesn't think anything ever happens in the small town of Long Thorpe, England. But she strays from a party and is snatched by a man who calls himself "Clover." He forces Summer into his cellar, where she finds three other young women who were kidnapped just like her. Summer, who Clover calls Lily, joins Poppy, Rose, and Violet as Clover's flowers, his family of beautiful, pure girls. REVIEW: My sweet niece recommended this to me. She has recently finished college, and I've never known her to be a huge reader. So when she recommended The Cellar to me, I jumped on it. At first, I was pretty underwhelmed. The simplistic writing style drove me nuts. How many choppy sentences that begin with "I" did I really need to read? Did anyone edit this book at all? I went to Goodreads, looking for a reason to keep reading. 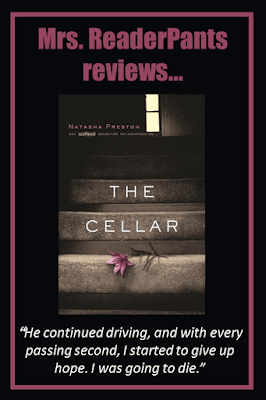 On Goodreads, I discovered that The Cellar was originally a WattPad title, which actually explains a lot. I've not read loads of WattPad titles, but the few I have read were badly in need of a strong editor. I pressed on anyway, thinking the simplistic writing style and short sentences could appeal to reluctant readers. The story itself is interesting; I truly wanted to know what happened. I liked the four girls and that the viewpoint bounces between Summer/Lily, Clover, and Summer's boyfriend Lewis. I wish we had also gotten Poppy, Violet, and especially Rose's perspectives. THE BOTTOM LINE: Ultimately, I did enjoy this book once I got past the simplistic writing style and numerous grammatical errors. This will be easy to booktalk, especially with reluctant readers. It will also help to encourage students to publish their own writing on WattPad or another online publishing service. You never know which publishers will see it! STATUS IN MY LIBRARY: Just added it to my first book order for my new school.